Growing interest in biosimilars, caution about CAR T, and increased use of genetic testing for AML patients are among the key findings. The FDA has recently approved a handful of biosimilars—biological medicines that contain a highly similar version of the active substance in an approved biologic product. And many more are in the development pipeline. Knowing how oncologists view biosimilars and how their perceptions are changing will be key to determining how treatment trends are likely to evolve over the next few years. Cardinal Health Specialty Solutions polled more than 200 oncologists to understand their views. DUBLIN, Ohio, Dec. 7, 2017 /PRNewswire/ -- Cardinal Health Specialty Solutions today introduced the second edition of Oncology Insights, a research-based report outlining the views of more than 200 U.S. oncologists on the latest medical advances that have the potential to transform cancer treatment. Most oncologists (51 percent) see CAR T-cell therapy as a game-changing approach to cancer treatment, but barriers such as cost, toxicity and complex administration could lead to slow uptake. As more biosimilars enter the U.S. market, oncologists are open to prescribing them in place of their reference products – and most (66 percent) have high expectations about the cost savings biosimilars will deliver for their practices. With three targeted therapies recently approved for acute myeloid leukemia (AML), most oncologists (85 percent) are routinely prescribing genetic tests for AML patients – and a growing number (31 percent) are now referring AML patients to academic medical centers for treatment. "This has been a landmark year for FDA approvals with the emergence of several innovative targeted therapies, new biosimilars, and the first two CAR T-cell therapies," said Joe DePinto, president of Cardinal Health Specialty Solutions. "Some of these advances have the potential to fundamentally alter how cancer will be treated. As more novel drugs come to market in the year ahead, understanding the changing views of oncologists and the potential barriers to adoption for new therapies will be critical for all stakeholders." The findings in Oncology Insights are based on research conducted at four Cardinal Health Oncology Summits earlier this year. In total, the summits brought together more than 200 U.S oncologists, representing a diverse mix of community and hospital-based practices. The report also includes viewpoints from Chief Medical Officers Chadi Nabhan, MD, MBA, FACP, and Bruce Feinberg, DO. 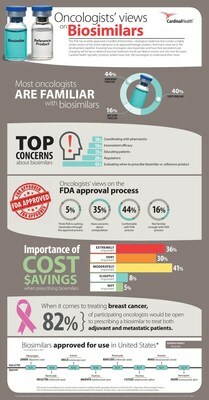 Request a copy of the Oncology Insights report at www.cardinalhealth.com/oncologyinsights. For media: to request an advance copy of the report, please contact Courtney Tobin at (614) 553-3539 or Courtney.Tobin@cardinalhealth.com. Cardinal Health, Inc. is a global, integrated healthcare services and products company, providing customized solutions for hospitals, healthcare systems, pharmacies, ambulatory surgery centers, clinical laboratories and physician offices worldwide. The company provides clinically proven medical products and pharmaceuticals and cost-effective solutions that enhance supply chain efficiency from hospital to home. Cardinal Health connects patients, providers, payers, pharmacists and manufacturers for integrated care coordination and better patient management. Because Cardinal Health helps ensure pharmacists and the consumers they serve have access to medications they need while working to help prevent prescription drug diversion, the company and its education partners created Generation Rx, a national program to help prevent the misuse of prescription medications. Backed by nearly 100 years of experience, with approximately 50,000 employees in nearly 60 countries, Cardinal Health ranks #15 on the Fortune 500. For more information, visit cardinalhealth.com, follow @CardinalHealth on Twitter and connect on LinkedIn at linkedin.com/ company/cardinal-health.